1. Fill a Cornucopia of Vocabulary Words – You can play this activity for several days and use either an actual cornucopia (I have both a decorative wire one and wicker ones), or print one like this and have your child color it. Then cut pieces of paper into small shapes – I like to make pumpkins, corn, and other simple festive shapes on orange, red, yellow, and brown paper. Work with your child on building target vocabulary words and every time one is considered “achieved” or “mastered”, add it to the cornucopia. If you’re using a paper version, just glue or tape the words on the paper cornucopia and hang it in an area of the house that is easy for your child to see. 2. 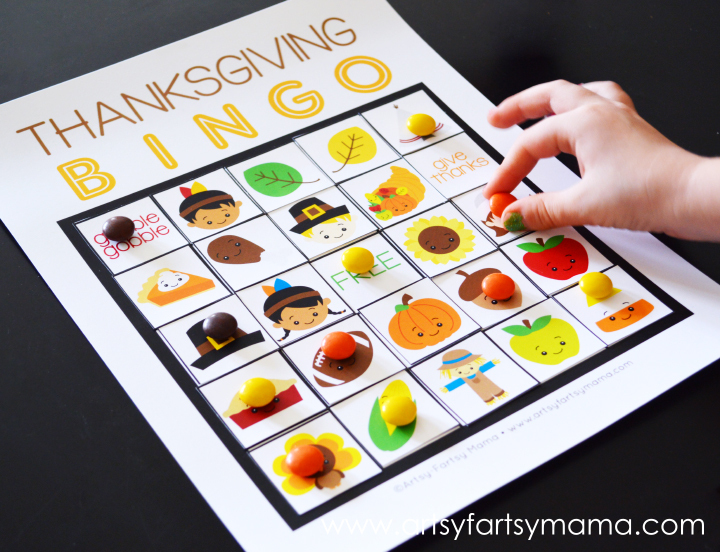 Make Thanksgiving Bingo Cards – You can create your own using clip art or phonics cards, or use free ones like this. To build on articulation skills, have your child repeat the words after you call them out during the bingo game. 3. Pumpkin Pie Mix-Up – Take 3 or more paper plates – one for each articulation target sound. Divide each plate into 8 equal pie pieces, just as you would cut a pie or pizza. On each slice, write a word that matches the articulation target. Mix up the pie pieces and see if your child can complete the pumpkin pies according to each target sound – encourage him to say the words aloud as he works on the puzzle. 6. Turkey Dance – Play this combination of the Chicken Dance and musical chairs. Take any of these turkey templates and print as many of them as you need for your target words. On each turkey, write a target word, then tape the turkeys in a circle on the floor. Play the tune to the Chicken Dance as your child dances in a circle on the turkeys, and stop the music randomly. All the players take turns calling out the target word of the turkey under their feet when the music stops. 7. Sing Some Songs – There are some great Thanksgiving songs to reinforce sounds like /t/ and /p/, as well as rhyming structures. The video below is a catchy tune with entertaining graphics, or you could try this turkey finger play. 8. Thankful Words – Take your target articulation sound and work with your child to come up with as many things about which to be thankful that start with that sound. Label the top of the paper “Thankful for _____ Sounds!” and then hang it where your child can be reminded of those things. 9. Build a Turkey – Start with a plain brown turkey body shape – think bowling pin shape. Cut out paper feathers from a variety of colors and work with your child to say target words or sounds as you write one on each feather. Have your child glue the turkey feathers to the body, continuing to practice the words. You can even have a whole gaggle of turkeys, each one with a target sound, such as /th/, written on the body of the turkey. Then your child can try to think of words that match that target sound and add them by writing them on feathers. 10. Pumpkin /P/ Play Dough – Make some homemade scented pumpkin pie play dough for practicing those /p/ sounds and create pumpkins, pilgrims, pies, and any other /p/ words your child can invent! This Thanksgiving I’m thankful for easy ways to practice those articulation sounds and help the kids build skills while they think we’re just playing and having fun. What are your favorite Thanksgiving speech therapy activities?